Intel's Skylake details, Surface Pro 4 clues. 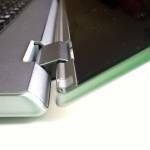 A Skylake prototype was shown at Computex in June which will give you an idea of the sort of form-factors that are possible but to cut a long article short we’re looking at desktop-capable fanless 2-in-1 PCs at the low-end and gaming-capable laptops at the high-end. 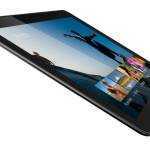 Skylake will support some interesting technologies like WiGig, advanced WiDi, wireless charging, USB-C and e-ink screens but at the core there’s a lot of new and interesting developments. These features are almost certainly going to be in the Surface Pro 4. On the Skylake CPU you’ll find a new Speed-Shift power-saving technology that appears to replace Turbo Boost and “Drastic power reduction vs. previous generation SoC power in video playback, multimedia, and win-idle.” 40-60% say Intel. Audio decoding hardware will be responsible for much of the video-playback battery life improvements and optimised core components will help to keep the background power down to a minimum in Windows idle situations. Modern Standby will be supported on some SKUs – almost certainly continuing the Connected Standby support we have on the Surface Pro 3. You’ll find more on the power efficiency of Skylake in this PDF. There’s a new imaging sub-processor on Intel Skylake that will help cameras, possibly even USB-connected ones, to the point where they could be streaming-optimised. The imaging processor will also help with RealSense 3D camera technology and Windows Hello (login via live facial recognition) processing. Multi-stream video capture is perfect for Twitch PiP scenarios which, with RealSense, will remove the need for blue-screen backgrounds. 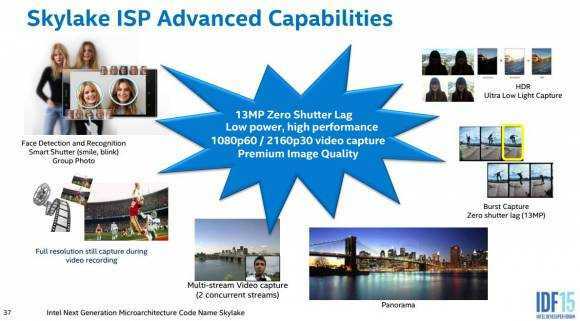 Skylake image DSP (ISP) capabilities include ‘zero shutter lag’ and face detection. New security features have been added to Skylake. 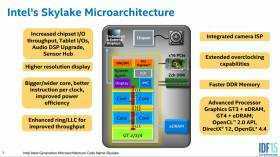 Intel SGX,is one example that lets applications launch in an ‘enclave’ which will enhance sandboxing. There’s more detail in the PDF but if you’re inquisitive about Device Guard and other new Skylake security features, take a look at this PDF. 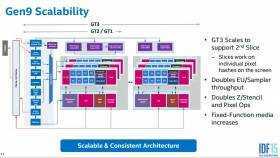 Moving on to the GPU Intel are sharing details about a potential triple-slice GT4 on-board graphics unit although that’s likely to be under the Iris Pro brand and adding a TDP that might not be suitable for Surface Pro 4 or lightweight Ultrabooks. Expect GT3, two-slice versions of the graphics architecture, as before. HD 530, as it will be known, includes support for Direct X 12 which brings new hardware decoded features and the potential for more efficiency in gaming. Intel indicate around 40% average performance increase over the 5th-generation GPU seen in Broadwell. In terms of video and Quick Sync support, HD 530 adds a lot. There’s a new real-time fixed-function encoder that will bring efficiency and stability to video conferencing and streaming (there’s that Twitch advantage again) and 8-bit HEVC encoding support which won’t be real-time but will help crunch those home-made 4K videos down to portable sizes. JPEG encoding will be hardware-accelerated in Skylake. Converting those RAW images to a small JPEG for Facebook isn’t going to take long then because there’s hardware support for RAW image files. RAW video processing is also supported. Video hardware improvements in Skylake Gen 6 graphics. Display support has been extended in Skylake. Multiple 4K screens, including wireless screens, will be possible along with support for the Panel Self Refresh 2 standard. Here’s what Intel are telling us about displays: eDP (internal) display up to 4096 x 2304 with 24-bit depth and 60 Hz. 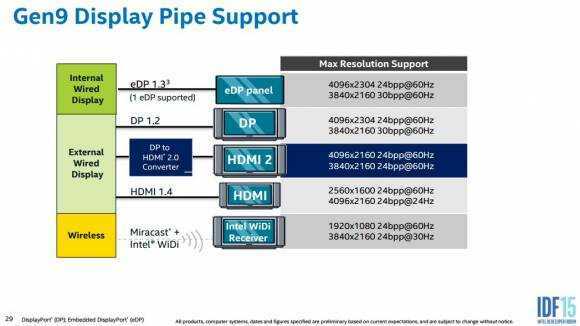 DisplayPort 1.2 support is the same but there’s a new HDMI 2.0 interface: 4K @ 60Hz. Finally, WiDi support goes up to 3840 x 2160 resolution at 30 Hz (full HD at 60Hz.) We’ll be looking out for more on the latest WiDi performance as IDF progresses. That’s a summary look at the features that Skylake will bring to the next generation of laptops, Ultrabooks and 2-in-1 PCs in 2016 and, possibly, in 2015. It’s a big step up from the Broadwell architecture and an interesting look at what could be coming in Surface Pro 4. Information and image sources: Skylake Architecture. Skylake Gen 9 GPU. So … the whole “Surface Pro” think … that is just SEO? Or is there some actual info? You’re looking at the next surface pro architecture. This is my opinion based on the options available – and there are no other. 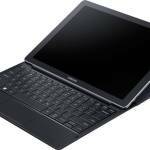 Iris Pro is coming for Ultrabooks. But its GT3e. Still pretty awesome. I am expecting almost twice the improvement over Broadwell 15W devices with HD 5500 graphics. 30% for the architecture, 40% for eDRAM. 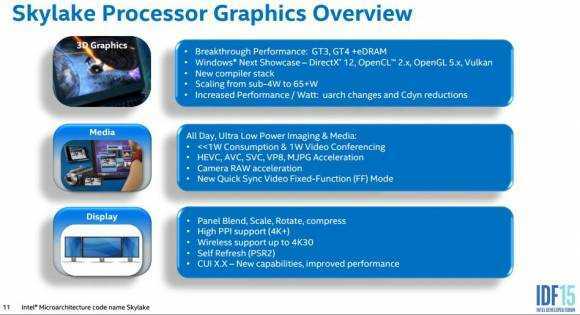 You’ll be essentially having first generation 47W Iris Pro 5200 graphics on an Skylake 15W Ultrabook. « Fusion Micro Supercomputer. Scampaign or Stupid?